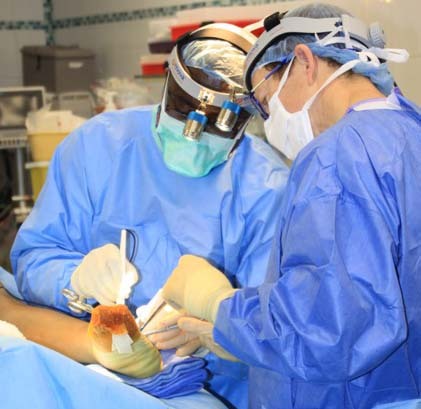 The mission trip surgical team repaired 66 extremities, 24 of which were club feet procedures. Ric Choudoir is on the end near the surgical tools. He is with Dr. Noonan (in middle) and Clinton Flores Turcios. Enova Illumination’s Mission Program exists specifically to provide LED surgical headlights to medical teams volunteering their time and skill sets to people in remote areas throughout Central and South America, Asia and Africa. Shedding Light recently caught up with Pediatric Orthopedic Surgeon Kenneth Noonan MD and Surgical Materials Coordinator Ric Choudoir from the American Family Children’s Hospital affiliated with the University of Wisconsin, as well as Sharing Resources Worldwide Co-Founder and Director Mary Dowling RN, to discuss their recent mission trip to Signatepeque, Honduras. Shedding Light: Before we talk about the mission trip, what are your backgrounds and how did the three of you connect? Mary Dowling: I’m with Sharing Resources Worldwide, which is a nonprofit that brings much-needed health care to children worldwide. I’m recently retired, but have a 37-year career as a neonatal intensive care nurse. My colleague Lisa Fernandez, RN, and I started SRW in 2002. Since then SRW has shipped over 110 containers of needed medical equipment and supplies worldwide and coordinated 51 medical and dental teams who have delivered direct services to over 5,337 children in five countries. Dr. Noonan: I’ve got about 20 years of experience in pediatric orthopedics with a specialty in pediatric spine deformities, as well as limb reconstruction for all children. You can find me at the American Family Children’s Hospital affiliated with the University of Wisconsin in Madison. I’m also a faculty member at the University of Wisconsin School of Medicine and Public Health. Ric Choudoir: I met Dr. Noonan when I was an orthopedics surgical technologist; something I did for 20 years. Now I’m the Surgical Materials Coordinator at the American Family Children’s Hospital and I help surgeons get the necessary supplies and equipment they need. I didn’t start going on mission trips until 2014. Dr. Noonan: I talked to Ric about the rewarding work we do on the mission trip; I’ve been going to Honduras for five or six years. Dr. Dave Mann, who is also an orthopedic surgeon at UW and a member of SRW’s advisory board, talked to me about doing mission work and introduced me to Mary. 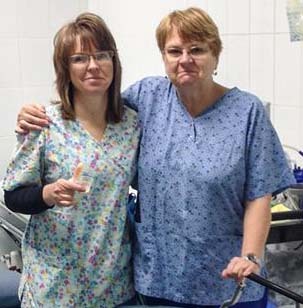 Mary Dowling, RN, Co-founder and Director of Sharing Resources Worldwide (on right) is with Wendy Read, RN. Mary Dowling: That’s usually how doctors become connected with Sharing Resources. We find doctors through other doctors or they find us through other staff. We look for people who are team players and a bit adventurous. They’ve got to want to work long hours during their off time and in facilities that are not like at home. Shedding Light: What are the conditions like in Signatepeque? Ric Choudoir: It is very remote. We worked in the mountains on a campus that has a hospital, a clinic, two orphan homes, and a K-12 school. Families of patients were already waiting for us when we showed up. Mary Dowling: Families brought their children from all over Honduras to be seen by the surgeons. None of the families could afford the surgeries provided by the surgical team. Everything was provided to them free of charge. Shedding Light: Can you describe a typical day and the surgical facilities available? 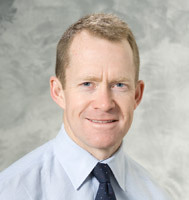 Dr. Noonan: Our surgical team also included Dr. Dave Mann and Dr. Sly Youlo. We started at about 8 am each day and worked until 8 pm; sometimes later. During the first day we saw 140 patients and then we had five days of surgery. Ric Choudoir: We rode a bus for 40 minutes to the hospital each morning. Sometimes we’d even pick up our patients who were walking along the road to get there too. We felt safe; the hospital is gated and secure and there are armed guards, but this area of Honduras isn’t a place for tourists. Dr. Noonan: The operating room at the hospital has very basic equipment. The overhead lights aren’t designed to provide the kind of illumination needed for surgery. That’s why the Enova LED headlights were so beneficial. We wouldn’t have been able to operate to repair 66 extremities, 24 of which were club feet procedures. The lights were amazing! Shedding Light: Which headlights did you use in Honduras? 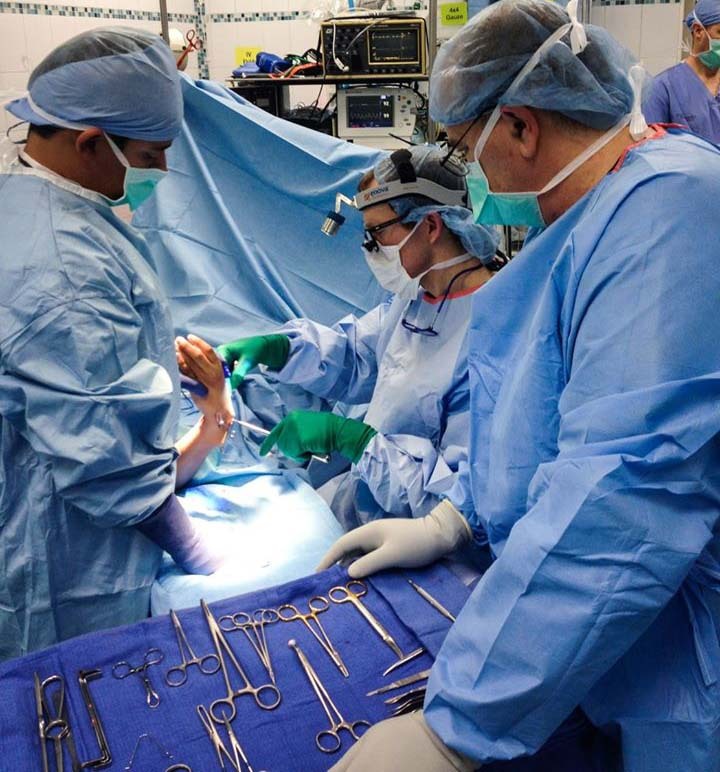 The surgical team used Enova’s Cyclops XLT-125 Headlights on their mission trip to Honduras. Dr. Noonan (on right) is shown with Dr. Sly Youlo. Ric Choudoir: Because of our past mission trips, we knew about Enova’s Mission Program. I called Jim Nelson and Enova donated two XLT-125 headlights for the week. Dr. Noonan: I’ve owned a couple of Enova’s Iris D-200 headlights for five years. The headlights are comfortable enough to wear for long periods. During a mission trip that’s invaluable, especially on those days we stayed until 10 pm operating. The battery packs are easy to recharge and last all day with no worries. Shedding Light: What do you get out of volunteering for mission trips? Dr. Noonan: The week in Honduras reminds me why I am a doctor. It’s just the patient, the family and our team working together to make the child better. There are no outside influences such as administration, insurance middlemen, the ability to pay etc. It is the most fundamental and pure physician-patient relationship that can exist. A patient needs help, and we can provide it. Thanks to Enova, we can also see what we’re doing! Ric Choudoir: These trips to Honduras are the most rewarding weeks of my life. I don’t speak Spanish, but smiles communicate exactly how the children and their families feel about us being there. Mary Dowling: Bringing dedicated generous medical volunteers together with children and families in need is why Sharing Resources Worldwide exists. I love seeing the wonderful outcomes!